This year’s Drug Info Association (DIA) annual conference is coming up in two weeks in DC, and I’m excited for four days of education, networking, and great conversations. As usual, the line up of speakers is top notch, so it’s been tough to try to plan on what to attend without feeling like I’m missing out on things. In terms of topic areas, I’m focusing this year on information/document management, of course, but also augmenting that with sessions on social media, knowledge management, digitization, and continuous improvement…all of which require a solid information/document management foundation to be successful. And beyond these, I found a few promising sessions that focus on the more organizational dimensions of drug development effectiveness. In your company, what does a content management strategy include? Does your organization take a holistic approach (i.e. all content and information) or a more targeted approach (i.e. content on certain systems, associated with certain processes, or belonging to certain departments or functions)? Until recently, each department or function at Schumacher was responsible for managing its own content. But with the company’s growth from a small, regional player in the health care industry to a super-regional player, Schumacher has begun migrating toward a more holistic model. With 150 facilities in 29 states, and more people involved in decision-making, operations needed to scale. And we needed to be able to demonstrate control over our information in a systematic, rational, and pragmatic way. What are some of your biggest challenges in executing your content management strategy? The biggest challenge is communication – of the need to manage content, the strategy for managing content, of the bad things that can happen from not managing our content, and the good things that can happen from effectively managing our content. You have to make information security and compliance part of everyone’s everyday life. Executives here get the need; the “what” is very clear. It is the “how” that needs to be communicated, as in: Tell me how that happens. The lesson for all of us is to communicate why our users need something – but how do we do it in a way that’s practical? What steps do we take to achieve this goal? How do you see the proliferation of information transforming your role in the enterprise, the business owners you serve and the overall success of the business as a whole? We’re experiencing 50 percent year-over-year growth in information. Content management now has to address a growing volume of structured, unstructured and semi-structured data. We’re trying to hit a moving target. And for an organization like Schumacher Group, which is in the business of saving lives, there are real consequences if we don’t get a grip on our ability to deliver the right information on time: people’s lives and health are impacted. Successful strategies boil down to the people who use them and carry them out. In your opinion, what are the leading characteristics of companies that are successful in user adoption over those that fail? The “hows” are important. 1) Intellectual honesty: Look at the problem and diagnose it. At times, this takes courage. 2) Reciprocity: When you go to the business users about content management, recognize that you are asking them for something: basically, asking them to change the way they work. You need to make sure they know what the benefits are if they buy in; things like cost reduction, security, and process improvement – improving the way that content flows. Help them see that you are finding them a solution, not just a workaround. Help them see information as intellectual inventory, with the opportunity to produce real value. Get them to see that information exists to be used to a greater end – in Schumacher’s case, patient care. What companies do you admire the most for their innovative content strategy approaches, and why? One company I admire is USAA, the organization that provides financial services to people and families that have served, in the U.S. military. USAA manages huge volumes of content – billions of images. In financial services, PNC Bank’s Treasury Management division. What do you think is the next big content management project/initiative large companies will take on in the next 5 years? The big concern continues to be securing content. There’s so much valuable content, yet it can be so vulnerable. You address security through encryption, making sure the right people get access at the right time. The recent data breaches of organizations like Target raised awareness, and companies starting to recognize it could hit them, too. You have to be able to see the risk. What are you most looking forward to for the DSF 2015 event? I’m looking forward to the opportunity to meet and exchange ideas with colleagues in my industry and across industries. Collaboration is the wave of the future. We have to continue to help the world understand that information does not exist to its own end; it exists to forward another goal. We have to continue to promote the idea that there is a better way – to see that massive repository of structured and unstructured data not as a landfill, but as a goldmine. For more information about the DOCUMENT Strategy Forum, click here. We look forward to seeing you all there! Now that the hustle of the end of the year is over, I’ve been turning to focus on Doculabs’ track of the DOCUMENT Strategy Forum (DSF), which takes place May 12 through 14 in Greenwich, Connecticut. The DSF has been going on for almost a decade, and it’s become the premier event for leaders and decision-makers in the customer communication management space – i.e. managing all the pieces of communication (e.g. bills, statements, marketing materials) that a financial services or insurance firm issues to customers, as well as all the additional pieces of communication it receives from them (e.g. applications, complaints, completed forms, signature pages). For DSF 2014, Doculabs was asked to help extend the conference into enterprise content management (ECM) territory, creating sessions focused on the distinctive challenges and opportunities facing ECM practitioners – from building a strategy and forming a program, to transforming content-centric business processes and enforcing compliance. And in doing this, we wanted to leverage real-world practitioners working at actual organizations, rather than industry experts and talking heads (like myself). In large measure, we were successful last year: We had 90 percent clients, 10 percent talking heads, which turned out well – because when they were freed from the responsibility of doing all the talking, our talking heads complemented the real-world experience of the organizational representatives quite well. For this year’s forum, we’re continuing with the same formula, but have been able to attract a greater number of high-level client executives to speak about their ECM efforts, most notably Rod Masney from Owens-Illinois and Chris Cotteleer from Schumacher Group. We’ve also recruited a wider range of industries in 2015. The track is still strong in financial services and insurance, of course, but it now also includes Health Care, Life Sciences, Oil and Gas, Utilities, and a range of Manufacturers (food, high-tech, and specialty). In the coming months, we’ll be posting more in-depth treatments of the sessions we’ve got on tap, as well as bios of the speakers, but if you’d like to read more about the conference, check out the session grid: DOCUMENT Strategy Forum. And if you’re interested in learning more about attending, here’s a link to the registration page. 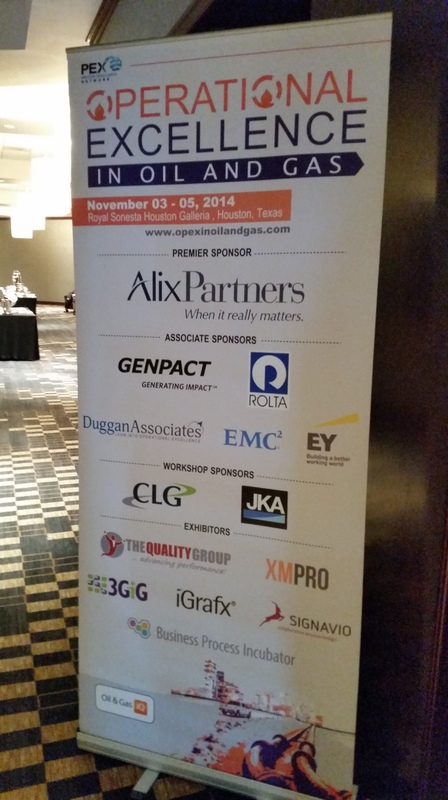 It’s been a great week in Houston for the Operational Excellence in Oil and Gas conference. All the sessions were high quality, tons of expertise and real world insights, and the networking and side conversations were fantastic. If you’re involved in O&G operations and missed it, you should definitely plan to make it next year. Given how valuable I found the show, I wanted to highlight some of the key themes and takeaways that I got from it. So here goes. I would say that 80% of the sessions discussed the challenge of talent: acquiring it, retaining it, developing it, managing it, utilizing it. There’s a shortage of resources in key roles and functions; resources are often located in one geo but needed in another; resource needs aren’t level, they’re subject to severe peaks and valleys, making resource allocation challenging…especially when oil prices drop or spike sharply; we struggle to attract the best and the brightest and, once we get them, often drive them away through outdated managerial styles and laggard technology. It’s estimated that 40% of the talent in O&G operations will retire out by 2020. Given all the challenges related to talent, how are we as an industry going to deal with that? And as prevalent as discussions of talent challenges were, there were absolutely no answers at all. It’s clear that everyone is still struggling to figure out how to solve this one–but we better find answers quickly, given how soon 2020 will be upon us. When asked what our key observations were from the event during the closing session, a 30+ year O&G veteran said that even as recently as five years ago, you wouldn’t have heard a peep about the role of corporate culture in operational excellence, whereas this week, practically every session stressed the importance of culture in achieving operational excellence. Folks came at it from different angles and with different methodologies and frameworks for understanding the role of culture, but no one discounted its importance. And the success stories from real world customers like Hess, Shell, FMC, and Oceaneering offered living proof that without cultural change, all the best practices and word class systems count for very little. From the opening panel to the closing session, it was apparent that O&G lags other manufacturing sectors in terms of efficiency. Vince Cipresso, who is relatively new to O&G but has spent a long career in manufacturing in industries like electronics, office furniture, automotive, and specialty chemicals, shared his perspective that O&G had a long way to go in using efficiency to drive cost savings, growth, or innovation. More often than not, during boom times, O&G simply throws more money and resources at production; in bust times, they give everyone a 15% – 20% haircut to try to salvage their EPS. And he wasn’t alone: lots of folks pointed to how, in their experience, O&G could learn a lot from other manufacturing industries, like aerospace, automotive, or specialty chemicals. From my perspective, I couldn’t agree more. The firms I’ve worked with all struggle to deliver even the most basic information management capabilities to their employees, e.g., type in a functional location to a search box and get the latest documents relating to it. In fact, none of the 30+ people in my pre-conference workshop said that their organizations provided this capability, which was pretty telling. Without the ability to reliably deliver up to date asset documentation, key business processes related to asset management are less efficient than they could be, from PM/CM, to inspections and TARs, to regulatory information requests. This was a ritual complaint at the event–not surprising given the recent dive in oil prices. When times are good, O&G orgs spend money like it’s going out of style and don’t care about getting efficient…we have tons of cash, so let’s not worry about it; when times are bad, they use short-sighted measures to cut costs that damage their ability to recover from the downturn, e.g., cutting off suppliers, cancelling projects, and instituting across the board budget cuts, rather than being strategic about reducing costs through operational excellence, supply chain discipline, etc. And no one blamed O&G orgs for doing this. After all, we all know that analysts are hounding them over the last few weeks for information on how they’re going to continue to drive shareholder value/EPS despite the drop in oil prices…and a long-term strategy of thoughtful improvements to operations is not an answer that plays well on the street! We heard about a lot of very futuristic, very cool technologies at the show that enable some pretty amazing capabilities, e.g., real-time performance monitoring and modeling across thousands of assets, solutions that enable document management across the entire asset life cycle, from design and construction, to operation and end of life, etc. But, as valuable as all these solutions are (and as I mentioned above),everyone is still struggling to get the bare bones basics right, i.e., give operations access to the right docs at the right time. Period. This is a huge problem that needs to be addressed. I’ve seen a variety of research out there, but I think it’s safe to say that TARs and PM/CM account for about a third of the downtime experienced at any given asset. Given the mess that asset documentation is in at most O&G orgs, it’s not hard to imagine at least a 5% efficiency gain for TARs and PM/CM if better document management were in place…not to mention the follow on benefits of improved HSE compliance and lower HSE risk. Well, that’s my take on the conference. If you were there, chime in and let us all know what you thought of it (and of my take on it). If you weren’t there, feel free to heckle my points above if you see the world differently. Either way–jump in, and let’s get the conversation started! So I just got back to the hotel fresh on the heels of my afternoon workshop at the Operational Excellence in Oil and Gas conference, which explored the ways that information management practices can impact O&G operations, both positively and negatively. There was too much discussion to try to reproduce here verbatim, but I wanted to capture the key takeaways I got from the session. First, trying to stress the importance of information management to O&G operational excellence was definitely preaching to the choir for the folks in my session. Some of them certainly knew more than others about information management processes and technologies, but no one in the room doubted the centrality of information management to the success of their work. Second, when I asked whether IT understood information management and was able to deliver value to the business in that space, the answer was a resounding no. Out of the fifteen or so firms in attendance, not a single one had anything good to say about how their IT shops handle information management. Third, there was rampant skepticism about enterprise class software, like ERP platforms, to deliver value and meet business needs. Most of the folks in attendance felt like they were too expensive to buy, painful to use, and weren’t delivering a value commensurate with the effort (and pain) it took to get them up and running. Finally, folks were universally looking for simple, blocking and tackling information management capabilities rather than futuristic, rocket ship type solutions. When I asked whether the document management systems at their assets allowed workers to type in a functional location, for example, and quickly retrieve the latest and greatest documentation, the answer was definitely no. In fact, most of the participants thought that having the ability to do this would be transformational to their operations. Of course, they also thought having the ability to manage asset documentation throughout the entire life cycle, from design and construction, to turnover, operation, and end of life using workflow would be great, too. But everyone agreed that simply having a good place to store their docs with a simple, effective way to retrieve them would be game changing…and a necessary first step to reaching these more advanced capabilities. So much for the pre-con. Excited to be a spectator for Day 1 (I present tomorrow) and see what folks have to offer across the industry. I’m gearing up for next week’s Operational Excellence in Oil and Gas in Houston, so I’ve been thinking a lot about the role information management plays in the path to operational excellence for energy firms. On the one hand, it’s a no brainer: without accurate information about an asset and the processes that maintain and operate it, you can’t be as efficient, effective, or safe as you would be if you had that information. On the other hand, oil and gas organizations overall have been historically poor at managing information, especially compared to firms in other industries, like banking, financial services, or insurance; so it makes sense that operational information wouldn’t necessarily be optimized yet at most O&G firms. But there’s a huge payoff for O&G firms that fix information management. Just consider a large asset like a refinery, petrochemical manufacturing plant, or offshore platform: downtime can easily cost $1M per day or more, paper drawings (often stored on site, in a blast zone) would run anywhere from $100M to $500M or more to reproduce if lost, off-PO purchasing reduces supply chain visibility and directly impacts quality, safety, and efficiency, mismanaged as-builts lead to increased downtime (from an hour or two to swap tools or supplies to a few days waiting for the right parts to come in), and poor version control on key operational documents like SOPs can have disastrous results. A turnaround at one of these assets can last 3 – 6 weeks (at $1M a day or more in lost production) and easily cost $50M, $100M, sometimes as much as $500M and up for the largest facilities. Given these numbers, even a modest increase in efficiency (1%) would yield significant returns for an organization. And given how central information is to managing a turnaround (and how poorly most O&G firms manage their information), it’s not difficult to gain this level of efficiency by doing some simple, lo-fi things to improve information management. For example, imagine having all relevant engineering drawings, as builts, inspection reports, SOPs, etc., in a single repository, tagged by a few key fields (such as functional location, process area) so that scheduling PM work orders, onboarding contractors, or compiling turnover documentation didn’t require tens, dozens, or hundreds of wasted hours searching for relevant information in shared drives, hard drives, email, desk drawers, file cabinets, and storage rooms. This would lead to tremendous efficiency and safety gains even without any information management bells and whistles, like workflow, ERP integration, or social collaboration capabilities. I’m leading a pre-conference workshop next Monday that’s going to tackle this issue head on with 20-30 practitioners from across a range of O&G firms. After a brief level set on what I mean by information management, we’re going to dig in as a group to find tangible, actionable ways that information management can transform the strategy and tactics of petroleum operations, based on our collective real world experience in the trenches working for operational excellence. I’ll be posting here after the event about what we come up with, but if anyone’s interested in taking part, you can register here – I’d love to have you on board with us.